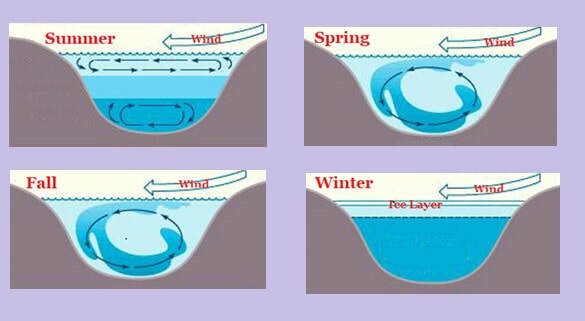 Water circulation is the mixing of water in a lake. Water mixes at the surface, within the top layer, the epilimnion, and among layers. The bottom layer of water is called the hypolimnion, and the water between the hypolimnion and epilimnion makes up the metalimnion. The metalimnion is also called the thermocline, because a drastic temperature change occurs the lower one goes in it. Mixing is facilitated by wind at the epilimnion and is possible due to water density variation between layers. When layers mix and change places, a lake is said to turn over. Turnover occurs when water in an upper layer is heavier, or denser than the layer of water underneath it.